Rod ends consist of an eye-shaped head with integral shank forming a housing and a standard spherical plain bearing, or a spherical plain bearing inner ring, or a spherical plain bearing inner ring and a sliding layer between the bore of the head and the inner ring. As a rule, rod ends are available with left or right-hand female or male threads. 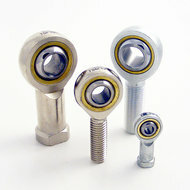 Rod ends from Rainbow have the sliding contact surface combines steel-on-bronze. Steel-on-bronze rod ends have very wear-resistant sliding surfaces and perform well under conditions of lubricant starvation. Rod ends with this sliding contact surface combination require regular republication. They are particularly suited for bearing arrangements where heavy alternating loads have to be accommodated. If you don't see what your looking for Contact Us.